Sometimes, even if it’s ridiculously easy, you know you’ve created the right ScuttleButton puzzle. Ifill & Woodruff / PBS Newshour / Your Winning Ticket — The moderators of the public television program, distributed at the 2012 conventions. 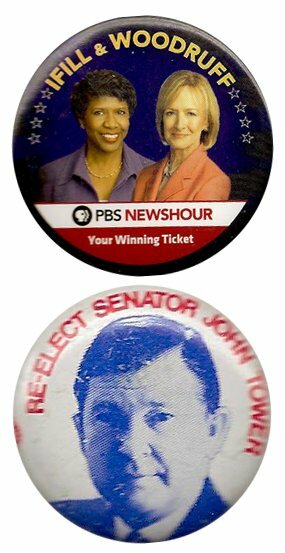 Re-elect Senator John Tower — A Texas Republican, this button is from his 1972 campaign. Eiffel Tower. Yes, an easy puzzle. And an appropriate one. And the randomly-selected winner is … Liz Klus of Johnstown, Iowa. Liz gets the coveted Political Junkie button.